The Newland House as it looked in 1948 and now. The Newland House Museum (pictured above) is the oldest residence built in the city of Huntington Beach and is maintained by the Huntington Beach Historical Society for all to see. This house was built in 1898 for Huntington Beach pioneers William and Mary Newland and their ten children. 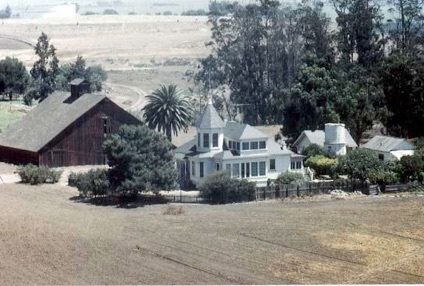 The Victorian farmhouse standing on high ground overlooking what was once known as the Santa Ana Gap, a marshy lowland between Huntington Beach and Costa Mesa. William and Mary Newland built the house and lived in it for over fifty years. The original Newland ranch extended from Beach Blvd. to Magnolia and from Yorktown south to Atlanta for a total of 500+ acres in which they planted lima beans, sugar beets, celery and later chili peppers. The house is open for tours to the public. Midwesterners like the Newlands, who were from Illinois, were attracted to California during the “Boom of the Eighties,” when Los Angeles experienced phenomenal growth. Increased opportunities for farming as huge ranchos were subdivided, reduced railroad fares because of a rivalry between Southern Pacific and Santa Fe Railroads and an intensive publicity campaign by Real Estate developers were contributing factors to the migrations. The Newlands purchased the mesa now known as Newland Center around 1897. Located at Beach Boulevard and Adams Avenue in Huntington Beach, the house pictured above was their home. The hill top location offers a stunning view of Huntington Beach. In addition to the land where the house was built, they also purchased about 500 acres to the south and east in “Gospel Swamp.” Though it looked like one big lake with islands of tule grass and willows, Newland had the insight and vision to realize he could clear and drain it for farming. This fertile valley soon became recognized nation wide for the variety and excellence of its produce. Celery, lima beans, chili peppers and sugar beets were grown on the bottom land and grain crops grew on the mesas. The Newlands were community leaders. They bought stock in the West Coast Land and Water Company which platted and sold the first lots in Pacific City, the town that became Huntington Beach in 1903. William held stock and served on the board of directors of Security Pacific Bank, the Huntington Beach News and several industrial businesses. In 1906, he established the Huntington Beach Canning Company and was instrumental in securing the Pacific Electric Railway route directly from Huntington Beach to Santa Ana. Later he served on the Highway Commission when Pacific Coast Highway was extended from Long Beach to Dana Point. The Newland farm was once the site of an ancient Indian village. The Newlands collected many artifacts found on the land. In 1930 the Works Progress Administration conducted an archaeological investigation of the mesa where the house stands and removed many artifacts. Additional excavations uncovered cog stones, shells and bone carbon dated at 5000 B.C. The site is a designated Orange County archeological site. The Newland House was described in 1899 as a modern nine-room, two-story cottage. 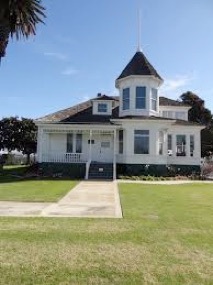 It is believed to be the only example of Queen Anne Victorian architecture remaining in Huntington Beach. Santa Ana contractors, Dawes and Kuechel were asked to integrate features and style reflecting the owners’ Midwestern background into the house they built in 1898. The Huntington Beach Historical Society restored it and obtained classification as a designated Orange County Historic Site. It was also placed on the National Register of Historic Places on October 24, 1985. The dominate feature of the original Newland House is its octagonal turret. With a magnificent view ranging from Signal Hill in Long Beach to Newport Beach, the turret room was originally planned as an office for Mr. Newland. He found it impractical to conduct his business there and Mrs. Newland turned it into a sewing room. The Newland ranch on which the house sat had a vegetable garden, berry bushes, an orchard, cows, chickens, turkeys, goats and peacocks in the yard plus a working stock of mules and horses. Outbuildings included stables, barns, corrals and bunk houses for the ranch hands who numbered up to 50 during peak season. Water came from an artesian well and kerosene and wood were used for light and fuel for cooking before electricity was available. Hours: Saturday & Sunday Noon – 4 PM, except holidays. Donations of $2 requested.